STARKVILLE, Miss. – Head coach Andy Kennedy said there is no way his team should win an SEC road game with as many miscues as Ole Miss had on both ends of the court Tuesday night against Mississippi State. But, the Rebels did win–giving Kennedy his 250th career victory in the process. 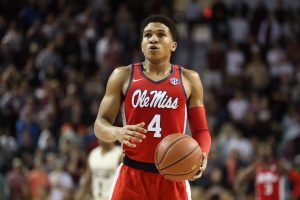 It took an extra five minutes for Ole Miss (17-11, 8-7 Southeastern Conference) to get out of Humphrey Coliseum in Starkville Tuesday night with an 87-82 win for the season sweep. Rebels’ freshman guard Breein Tyree put the team on his back, scoring a game-high 24 points, eight of which came in overtime. Senior forward Sebastian Saiz notched his 18th double-double of the season with 23 points and 10 rebounds. Saiz was a perfect 11 for 11 from the charity stripe, and his fourth rebound of the game placed him alongside former Rebel great Murphy Holloway as the only two players in school history to reach 1,000 points and 900 rebounds in their career. Tyree opened up the extra period with a 3 to give the Rebels 70-67 lead, and Ole Miss would go on to extend its lead to 10 with 2:23 left with foul shots from Tyree and Justas Furmanavicius. Tyree made three foul shots; Furmanavicius made two. Mississippi State (14-13, 5-10) sliced its deficit to five after two foul shots by I.J. Ready, but it wasn’t enough for the Bulldogs to mount the comeback. The game looked to be over in regulation when the Rebels built their lead to 61-52 with 3:36 left in the game off two foul shots from Saiz. But the Bulldogs outscored Ole Miss 15-6 to force overtime. Ready scored Mississippi State’s final six points of the second half, including a layup over Saiz that tied it at 67-all with two seconds left on the clock. Ready, who didn’t play in the first meeting, finished with 20 points for Mississippi State. Mario Kegler added 15, Quinndary Weatherspoon 14. Xavian Stapleton provided 11. Neither team shot at a proficient rate throughout the game, and each had costly turnovers during pivotal moments of the game. Ole Miss made 24 of 65 shots from the field, while Mississippi State converted on 31 of 74 shots. “I just told our guys ‘That was one of the worst games we played all year,’” Kennedy said. At one point in the first half, the Rebels were looking to pull away when Cullen Neal drained two 3’s to give Ole Miss the 15-11 lead. But the Bulldogs quickly took the lead moments later off Ready’s layup that was followed by Weatherspoon’s tip-in of his own miss. The Rebels grabbed a 21-20 advantage off two layups by Tyree, but Kegler’s 3 with 36 seconds on the clock put the Bulldogs back up for a 25-23 halftime lead. Mississippi State made only 3 of 9 shots from long range in the first 20 minutes. The Bulldogs were also outhustled in a portion of the rebounding category, allowing Ole Miss to have the 32-31 defensive rebound advantage. The Rebels scored 22 points off 22 Mississippi State turnovers and limited Lamar Peters and Weatherspoon to just 21 points on 8 of 22 shooting between the two. Terence Davis added 12 points and 10 rebounds. Deandre Burnett provided 10, with eight of his points coming from the free throw line were he was a perfect 8 for 8. 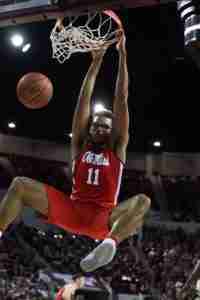 The Rebels have won 7 of their last 8 meetings against Mississippi State. Andy Kennedy now has 250 wins as a head coach. Ole Miss made 34 of 44 shots from the foul line. The Rebels made 5 of 23 from 3-point range, with Cullen Neal making three of them. He had nine points. The Bulldogs have now lost five straight games, with their last win coming against Tennessee on February 4. Mississippi State won the rebounding battle, 49-48. The Bulldogs had 22 bench points, 20 second-chance points, and 50 points in the paint. Mississippi State made 14 of 25 from the free throw line. Ole Miss hosts Missouri on Saturday (2:30 p.m., SECN). Mississippi State travels to Vanderbilt on Saturday (3:00 p.m., ESPNU).